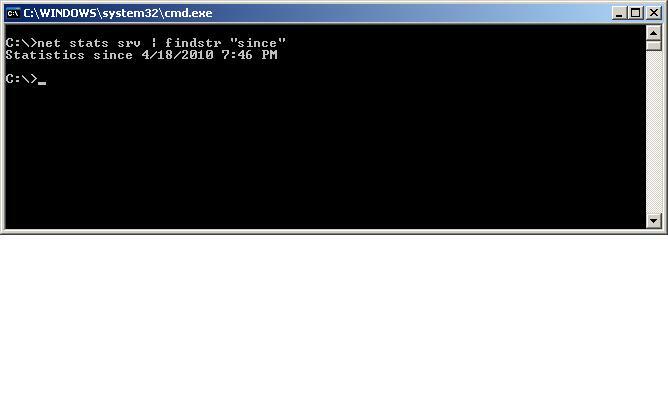 When running windows system check scripts it’s nice to know when your server was last rebooted. The command shown bellow generates this information. net stats srv | findstr "since"
I’ve recently done quite a lot of interviewing. Last time I added up the total number I realized I’ve done over 15+ in the past month alone. Each interview and company has been different in many ways. In this post I will review some of my observations and preparation techniques I’ve used. To be clear I will not be revealing specific interview questions posed by any companies but will present some broad examples which are not directly correlated to a single entity. When talking to a recruiter make sure they outline the roles and responsibilities of the position. Key pieces to focus on are the level of the position (Senior / Non-Senior / Architect etc. ), Travel expectations, and most important what the format will be for the first interview. As part of the format question you should ask if there is any specific topic they would like you to be able to speak about. With this in midn do your homework! I was surprised that only one out of 10 companies I interviewed with actually followed up on this question with legitimate “home work” for my interview. In my opinion more companies should give potential candidates home work for their interview. This ensures that the candidate knows what is expected of them and also helps the candidate get a head start on researching products which he/she is either not familiar with or has not recently worked on. A case in point. I know EMC DMX arrays really well. I’ve worked in large and small environments which utilize pretty much every replication option they have. I have however not touched a DMX in a while. So… going into an interview where DMX hardware is in use I review my DMX notes and login to EMCs support site and read the latest news. This goes beyond the marketing fluff… I dig into how the latest micro code impacts provisioning requirements and also what the latest technology shift & value added proposition is. The point I make is be ready to talk… because that’s all an interview is talking and more talking. This brings up an additional point. Bring examples of your work. I can’t stress this enough, talking about your work and showing your work are two entirely different things. Demonstrate what you hope to accomplish and show them how you’ve accomplished similar tasks in the past. I print out example documents I’ve written which bolster my value added approach in an interview. Dropping a 25+ page document on the table keeps me from having to explain every minute detail regarding ECC discovery issues, shut down & start up procedures etc. It also dictates that I can backup my pitch. It’s crunch time… the interview makes or breaks all the work you’ve done leading up this moment. Saying it that way adds more stress then is actually warranted. The interview should accomplish one thing and one thing only. The one thing is determining whether you are a good fit for the company and also more importantly if the company is a good fit for you. I realize this sounds like two things but it’s really one thing finding the answer to the “is this a good fit question”. With this in mind technical interviews are not your average meet and greet session. Bellow I’ve outlined how I approach technical interviews. Review technical fundamentals & current best practices associated with your profession. Follow up with a simple thank you note. This will ensure the people you interviewed with know that you are interested in the position and will also foster further communication. A question which is commonly asked is “should I follow up with everyone I interviewed with?”. This is a tough one since sometimes I’ve interviewed with as many as 9 people at a time. It all comes down to a judgement call. In some cases it may only be necessary to follow up with the key decision makers. In any case you get points for doing your due diligence and thanking all parties for both their time and the presented opportunity. Be ready to back up your claim by showing them the value you present. It’s quite simple… research your specific industry. Find the rough median salary and also the range of salaries being offered. This last bit is crucial. One of the key questions you’ll be asked during the interview process is “What is your salary requirements?”. This is a leading question and should be responded to with an equally important question; “What is the salary range for the position?”. The companies response will dictate whether or not they can accommodate your requested salary. It will also dictate the level of the position and the potential for growth. One rule which I stick to is to never take a position where I am maxing out the “band” salary range. This will never look good in a promotion review. Under achievers and lifers max out their salary band range. Bold employees who hit the ground running receive a high salary which is in the median range of the total salary range. Be very careful when reviewing offer letters. A key piece to check is the conditions of the offer. These can be in the form of signing bonuses which have retention periods or certain requirements you’ll need to meet to either qualify for the position or to retain a signing bonus. Another loop hole may be conditions written into the offer letter which dictate how your salary will be calculated and the possible impact of moving from a high profile contract to a lesser contract. This last piece is the most crucial out of the above pointers… an offer is not real until you receive a written/physical copy. It is also important to note that verbal agreements are just that… verbal. Until you sign an official offer letter (no contingencies) you are not obligated to work for the company. This last piece may raise flags with recruiters and companies. The fact of the matter is that they are not committed to employing you until all paper work has been officially approved and signed off on. My pessimistic approach to dealing with offer letters and companies in general usually yields better results. I want them to push just as hard as I’m pushing to find and follow through on a good offer being made. Retention periods: Maximum 12 months. If you are presented with a 2 year or 18 month contract negotiate down to 12 months. They may also present a sliding scale in terms of retention period and the amount of money you’ll need to pay back. Base Salary Guaranteed: By this I mean no matter what contract they end up putting you on they must pay you the base salary stipulated in the offer letter. Conditional Offers: Companies can present conditional offers as stated above which require either that the company win a contract or that you full a specific requirement. When presented with an offer of this kind DO NOT stop researching and pursuing other opportunites. This last piece is key, since there are no guarantees with a conditional offer. Performance based incentives: Always note the percent of salary they offer on yearly performance based incentives. Also ask what the average incentive was last year for someone in a position equivalent to the one you are applying for.